As part of its tenth birthday celebrations this year, the Capital Region Farmers Market is launching its very own cookbook on Saturday 1 November 2014. “This past year has been a big year of celebrations for us, and this cookbook really is the culmination of ten years of Farmers Market history,” said Vic Gibbons of the Rotary Club of Hall which founded the Capital Region Farmers Market in 2004. “The book is about sharing the stories and recipes of the people and produce who have made our Market what it is today,” Vic continued. The Capital Region Farmers Market cookbook is another community-focussed project by the Rotary Club of Hall and has been a long time in the making. The book is packed with recipes and food ideas from many of the Canberra community’s most loved Farmers Market stallholders. 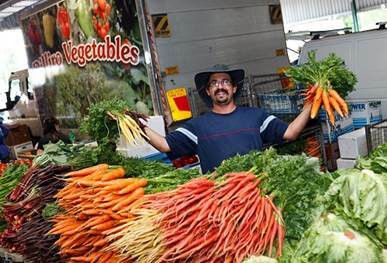 “We really do have all the right ingredients to make our Capital Region Farmers Market fabulous each week. 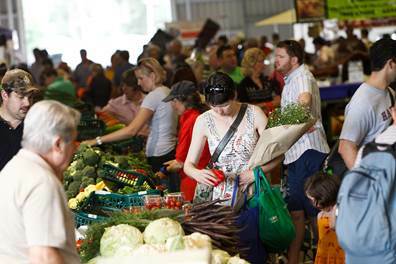 The Canberra community, our enthusiastic shoppers, fresh local and regional produce and the passion and commitment of our farmers and producers each Saturday morning. The cookbook showcases our award-winning recipe in print. “We’re sharing more of the Market’s history and our long association with the forchefs project. And of course you can salivate over and create a good selection of recipes from our stallholders, Rotarians and forchefs,” Vic continued. The cookbook includes recipes for starters, soups, salads, sides, mains, cakes, biscuits, desserts and more and will be launched on Saturday 1 November by chef Andrew Hollands, one of the original chefs who kicked off the valued forchefs program in conjunction with the Market. ACT Deputy Chief Minister, Andrew Barr, will also be there to present certificates to a number of stallholders who have been with the Market over the past ten years. “We’ll be launching our cook book just in time for Christmas, and it’s going to be a real cracker. We’ll have a cooking demonstration set up beside Bicentennial Park at the Market and copies of the cookbook will be available for purchase from launch day,” Vic continued. The Capital Region Farmers Market cookbook will be available for purchase for RRP $20 from the Market’s Rotary Help Desk from the launch day until Christmas.